Traumatic Incident Tension: No Very good Deed..
..goes unpunished, they say. Nowhere is that more true than with those who respond to disasters- natural or man-made, where death and severe injury is present. These workers are at risk of experiencing stress from what psychologists refer to as a traumatic incident. A traumatic incident is one that may involve exposure to catastrophic events, severely injured children or adults, dead bodies or body parts, or a loss of colleagues. All workers involved in response activities help themselves and their coworkers and reduce the risk of experiencing stress associated with a traumatic incident by utilizing simple methods to recognize, monitor, and maintain health on-site and following such experiences. As emergency responders, we often feel a need to “be brave”, impervious to the bad things we see, stoic in the face of tragedy. Unfortunately, that is not the case. The very parts of our nature that drive us to respond to disasters- to help those most affected- also prevents us from turning a completely blind eye to what we witness. We may fool ourselves for a while, but sooner or later, it will surface. Immediately following hurricanes Katrina and Rita, I found myself in New Orleans, serving in the city’s Emergency Operations Center as a Safety Officer. In the ten months I served, four of those months were with the New Orleans Fire Department‘s Urban Search and Rescue team. From March through June, 2006, our mission was to make a final sweep through New Orleans devastated 9th Ward searching for any as yet unfound victims. This entailed going from one ruined home to another, led by teams of cadaver dogs. Climbing over stinking refuse and debris, trying to block out the fact that these had been people’s homes- where children had been raised, homework done, Christmases and birthdays celebrated. And yes, even 6 months after the storms, there were remains to be found. During this mission, twenty six total. Of all of these, there was one recovery that stands out vividly in my mind. We had been given an address for a couple of residents that had been reported missing by the family- two brothers who had not been heard from since before Katrina had struck. Searching through what remained of the home using the dog teams and literally picking the structure apart with an excavator, the remains of the brothers were finally located. But, the story did not end there. The dog had alerted on something else nearby. A pile of debris, what looked like the roof of a garage lay atop what was left of other structures, all commingled in the corner of a lot, where it had come to rest against another house. The dog alerted several times in this are, and the team searched.. and searched.. dug through the debris and searched more. After a couple of hours, the debris had been pulled apart with nothing found. Another dog was brought in, and it, too, alerted in the same area. Frustrated and tired, the team called off the search, sure that what the dogs had alerted on had probably been fragments carried by wildlife from another location. The next morning, it was decided to give it one more try. After a bit more digging and removal of debris around the perimeter, the dog again alerted- this time on a bit of blue canvas half buried in the dried mud. Carefully, the dirt was removed from around the find, uncovering a blue, Tommy the Train child’s knapsack. Underneath that, a small skull and a few other pieces of bone. I never learned her name, only that she had been 6 or 7 years old, and had been wearing the knapsack, ready for her parents to decide whether they were going to evacuate or not. Inside the knapsack were a couple of dolls, and other items that were obviously of great importance to her. It was over a year after I returned home from my service in New Orleans before I could tell that story to anyone without physically choking up. Of all of the things I had seen or heard during those 10 months- of all of the death and destruction I had witnessed.. that was the one thing that got stuck sideways, as they say. It wasn’t until I sat down with a trusted friend and forced it out, that I was finally able to move past that experience. I submit this as an example of the kind of stress we all face as emergency or disaster responders. Everyone is familiar with Post Traumatic Stress Disorder (PTSD). TraumaticIncident Stress (TIS), while similar, is not quite the same thing. If not dealt with in a timely manner, however, it can result in PTSD. TIS builds within a person’s psyche incrementally, depending on the severity of the situation and the person’s duties. Those whose duties puts them “in the trenches”, working first hand with victims and the worst of the destruction are the ones most at risk. Responders need to take care of their own health to maintain the constant vigilance they need for their own safety. Responders must be able to stay focused on the job in the dynamic, changing emergency environment. Often responders do not recognize the need to take care of themselves and to monitor their own emotional and physical health. This is especially true if recovery efforts stretch into several weeks. The following guidelines contain simple methods for workers and their team leaders to help themselves and their team members. These guidelines should be read while at the site and again after workers return home. Pace yourself. Rescue and recovery efforts at the site may continue for days or weeks. Watch out for each other. Coworkers may be intently focused on a particular task and may not notice a hazard nearby or behind. Be conscious of those around you. Responders who are exhausted, stressed, or even temporarily distracted may place themselves and others at risk. Take frequent rest breaks. Rescue and recovery operations take place in extremely dangerous work environments. Mental fatigue, particularly over long shifts, can greatly increase emergency workers’ risk of injury. Eat and sleep regularly. Maintain as normal a schedule as possible and adhere to the team schedule and rotation. Drink plenty of fluids such as water and juices. Try to eat a variety of foods and increase your intake of complex carbohydrates (for example, breads and muffins made with whole grains, granola bars). Whenever possible, take breaks away from the work area. Eat and drink in the cleanest area available. Recognize and accept what you cannot change—the chain of command, organizational structure, waiting, equipment failures, etc. Talk to people when YOU feel like it. You decide when you want to discuss your experience. Talking about an event may be reliving it. Choose your own comfort level. If your employer provided you with formal mental health support, use it! Give yourself permission to feel rotten: You are in a difficult situation. Recurring thoughts, dreams, or flashbacks are normal—do not try to fight them. They will decrease over time. Communicate with your loved ones at home as frequently as possible. Reach out—people really do care. Reconnect with family, spiritual, and community supports. Do not make any big life decisions. Make as many daily decisions as possible to give yourself a feeling of control over your life. Spend time with others or alone doing the things you enjoy to refresh and recharge yourself. Be aware that you may feel particularly fearful for your family. This is normal and will pass in time. Remember that “getting back to normal” takes time. Gradually work back into your routine. Let others carry more weight for a while at home and at work. Be aware that recovery is not a straight path but a matter of two steps forward and one back. You will make progress. Appreciate a sense of humor in yourself and others. It is okay to laugh again. Your family will experience the disaster along with you. You need to support each other. This is a time for patience, understanding, and communication. Avoid overuse of drugs or alcohol. You do not need to complicate your situation with a substance abuse problem. Get plenty of rest and normal exercise. Eat well-balanced, regular meals. Critical Incident Stress Debriefing (CISD) is a facilitator-led group process conducted soon after a traumatic event with individuals considered to be under stress from trauma exposure. When structured, the process usually (but not always) consists of seven steps: Introduction; Fact Phase; Thought Phase; Reaction Phase; Symptom Phase; Teaching Phase; and Re-entry Phase. During the group process, participants are encouraged to describe their experience of the incident and its aftermath, followed by a presentation on common stress reactions and stress management. This early intervention process supports recovery by providing group support and linking employees to further counseling and treatment services if they become necessary. Are you tired of calling your data protection vendor and having them tell you that your issue is a hardware problem only to have the hardware vendor point the finger back to the solution provider? Finger pointing is a huge waste of time and can actually cause major disruptions in service. When choosing a data protection solution, look for one that offers peace of mind through world-class customer support as well as subscription and support (maintenance) contracts, which provide enormous financial value to customers. For example, all improvements made to a solution in the past three years as well as the planned improvements for the next three years should be taken into consideration, such as source and target data deduplication, the eight-fold increase in scalability and substantial improvements in reliability, performance and ease of use. The best of both worlds is where all these new features are provided to existing customers at no additional charge through their subscription and support contracts. These customers enjoy all the benefits of new versions as they are released without incurring additional costs. As a result, subscription and support will be significantly enhanced during the lifespan of the solution. Another factor that is just as important is the quality of support. If you have multiple products cobbled together to create a solution, this can be a real problem as there is no single owner to any issue that occurs. The appliance model of data protection excels here as the appliance provider can support the hardware, software, operating systems and everything in between. When choosing your data protection solution, do not discount the value of support and subscription as it can make your life a lot better having a good support organization standing behind your solution. How numerous lives does your data have? SANDY- if you live in the northeast you will not forget her name for a long time. Every CEO, business owner and home owner was holding his/her breath as Sandy blew over us. I know I was. My house is surrounded by trees and every time a 50 mph gust came, I was praying to the higher power that the branches held up. Unfortunately a tree on the adjoining street couldn’t hold up and came down, knocking the power out from our neighborhood for a day. We were the lucky ones! Others in the NY and NJ area weren’t so lucky. The damage to people, property and businesses in NY and NJ is unimaginable. According to early estimates over 100,000 homes and businesses were completely destroyed or severely damaged. Many business owners have lost everything and may never recover. All their life’s work gone in a blink of an eye. My prayers go out to people who have been disastrously affected by Sandy. Could they have done more to protect their businesses? In some cases the answer is no; we are powerless in front of mother nature and despite our best preparations things can go real bad. But in many cases, I am sure business owners are cursing themselves for not being better prepared. Most businesses do not have disaster recovery plans in place. Simple things like backing up data in a secure place, having redundant power supply such as a portable generator are not in place.Taking these simple steps can mean the difference between business recovery or business death. Events like Hurricane Sandy remind us how close we get to losing everything. Its just a matter of luck that one business or home gets destroyed and another doesn’t. Yet many of us thank our stars and move on without really considering what we can do to protect our family, home and business in the event of a disaster. We live in an information age and our life is practically a collection of bytes. Apart from a few hard copies most of our information is now stored in electronic format. Now is the time for those of us lucky enough to escape unscathed from Sandy to take a look at what is important in our lives and take steps to safeguard it. Do we have all our important documents in a safe place? How about all our electronic data- our files, family pictures, legal information, financial information? Have they been backed up online and can we recover them easily afterwards? Knowing that we can recover our critical data after a disaster will make the recovery process relatively easier. So unless your data is a cat with nine lives, Sandy just used up one. How many more lives does your data have? Sameer Sule is a Business Technology Consultant at Kinara Insights, a company providing contingency/disaster recovery planning services to doctors, dentists and healthcare practices. He helps his clients understand and use technology to reduce practice downtime, increase efficiency and improve quality of patient care. In today’s fast-paced society, companies of all sizes need affordable ways to deliver quality IT services reliably and continuously. One of the key benefits of cloud computing, one that is also often overlooked, is how cloud computing can help ensure business continuity, as well as speedy disaster recovery. Cloud hosting offers a low-cost disaster recovery and business continuity solution for small to midsize businesses and a more cost-effective DR alternative to larger, cost-conscious corporations. With the cloud as your disaster recovery solution, you can use your in-house systems to run your core business and work with a cloud hosting provider for your business continuity and disaster protection. With cloud hosting, your data and software are replicated automatically in the cloud, creating increased redundancy. You don’t have to buy extra hardware or software to mirror your data center environment. Instead, cloud servers can be easily partitioned to create multiple environments in the cloud, and these cloud servers can be spun up and configured in a matter of minutes. In addition, with cloud computing and cloud storage, you only pay for the resources you use, so the cost is minimal. A cloud-based disaster recovery/business continuity solution works well for any business with a low tolerance for downtime and data loss. For example, most SMBs and larger businesses today fall into this category, rather than the local irrigation maintenance company, who may be able to survive a week without their data. Businesses like hospitals have very minimal tolerance for downtime and data loss due to the urgency and sensitivity of their data. With cloud hosting from a premier cloud hosting provider like Atlantic.Net, your data and applications reside in an offsite, secure data center facility with a backup, uninterrupted power supply, and dedicated support staff to support business continuity in any situation. Though many business continuity standards emphasize the importance of tracking corrective actions to address identified issues, the recently published ISO 22301 (and previously BS 25999-2) also requires conducting a root cause analysis – looking not just at an issue, but its cause and how it can be prevented in the future. Root cause analysis (RCA) is an approach that seeks to proactively prevent reoccurrences of the same adverse event or systems failure by tracing causal relationships of a failure to its most likely impactful origin, then putting measures in place to mitigate underlying causes to ultimately help prevent recurrence of the adverse event in the future. While common in disciplines that deal with extreme precision and protection of life (e.g. quality and environmental health and safety), there’s no reason the business continuity discipline cannot benefit from a similar approach, particularly for practitioners looking to fully implement ISO 22301. This article explains root cause analysis and identifies how organizations can benefit from implementing the concept in a business continuity context. The concept of root cause analysis was originally developed by Sakichi Toyoda (the founder of Toyota Motor Corporation), who developed a process called the “Five Whys” to understand potential causes for problems beyond what was immediately obvious. Root cause analysis became more formalized as it was integrated into several different fields as a performance driver, such as safety, quality, operations and information security. In each of these areas, reactively responding to an issue was not enough – future issues needed to be prevented, and root cause analysis was the path to enable improved performance and risk mitigation by eliminating true causes, rather than just symptoms. Incorporating root cause analysis into existing business continuity-related corrective action efforts could very well minimize the likelihood of future disruptive incidents and decrease recovery times. Problem: IT recovery personnel failed to recover the organization’s SAP system within its recovery time objective of 24 hours during last week’s IT DR test …. Why? IT recovery personnel said that SAN LUNs were not mapped correctly, which drastically delayed the start of restoration from disk … Why? Vendor personnel responsible for prepping the equipment failed to execute the setup specifically to documented expectations … Why? Vendor personnel indicated that the instructions seemed contradictory and did not provide the level of detail necessary to execute steps, so they used a basic default setup …Why? Upon analysis, documentation did leave out several crucial steps necessary to enable this complex LUN mapping to occur …Why was this not found earlier? When performing previous testing, personnel did not fully leverage existing plan documentation … What changed this time? The individual responsible for documenting the plan and performing past testing was unavailable, and personnel who performed testing this time indicated they were not properly trained on use of the plans, nor were they instructed on how to escalate issues regarding recovery processes. Although it might seem the root cause was reached, simply fixing the documentation does not ensure future documentation will be accurate. Taking it deeper, the previous IT subject matter expert responsible for documenting the procedures often does onsite testing without using documentation, as he has extensive experience in this field and felt he could perform tasks more quickly by recovering based on experience as opposed to documented procedures. Exploring the issue further revealed that newer personnel assigned to recovery tasks were far less experienced and had not yet received an appropriate level of awareness training. Related to this point, the IT Director admitted he never required other personnel to validate documentation, as testing takes time away from production support and leveraging the “experts” in each phase lessens testing time. Part of the solution to this could be to implement an expectation that all documented procedures be validated at least annually by another IT individual within a different area of expertise. A second part of the solution could be to perform appropriate training up front (that emphasizes familiarity with plans and knowledge of escalation procedures) for both alternate internal individuals and any vendor resources responsible for plan execution. Together, these efforts could help assure that all IT DR documentation can be effectively used by both internal and external resources during testing. Although simple in theory, identifying the actual root cause and figuring out when you’ve gone far enough can be complex in practice. 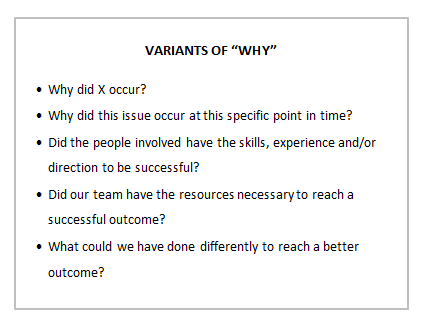 To help understand primary root causes, you must repeatedly ask variants of “why” (and a few other probing questions), then look for the answer that seems most likely to have influenced the issue. While there may not be a “hard science” to root cause analysis, the deeper you look for causes, the more likely you are to find issues to resolve. In most cases, the biggest issue most organizations face is not exploring problems in the first place! Our example demonstrated this problem in the recovery of SAP. However, it’s likely this problem (the shortcuts) exists in other areas, and addressing the root cause could improve performance and recoverability elsewhere. Within business continuity, there are several areas that can commonly be identified as root causes for risk mitigation, response and recovery performance issues, although again, it requires tracing issues back further than most professionals choose to explore. To properly integrate root cause analysis into continuous improvement activities, each issue should be adequately documented, including source of issue, a detailed description, an identification date, and it should also have a field to capture root cause analysis. Rather than one individual trying to identify the root cause, business continuity personnel should organize and facilitate discussions that involve subject matter experts to whom issues may be assigned or who can provide insight on an issue, and then the group should seek to trace the issue back to its origin together. Within business continuity, there are numerous root causes that can lead to a variety of issues or complications. The following table notes a few examples, together with likely root causes, though this is far from a complete list. Also, it’s important to note that just like with tree roots that feed a tree’s growth, there could be more than one root cause that affects a system and results in a problem, so it is important to trace all potential paths of an issue’s origin back, rather than just pursuing one direct cause, to identify all influencing factors. Again, root cause analysis is not just solving one instance of a problem, it’s also seeking opportunities to prevent future occurrences of an issue. Once the origin of an issue is identified, it’s important to evaluate all areas of the business to identify other at-risk areas and ensure proper risk mitigation measures are put in place. A solution in one area may not necessarily be applicable to all other areas of an organization, but even if it’s not, the act of identifying other similar at-risk areas raises awareness and enables the organization to develop additional solutions that make sense and address these risks before they result in future issues or downtime. As business continuity management systems continue to mature, root cause analysis will become a powerful tool for business continuity professionals to deeply examine the cause of issues and provide an opportunity to correct them before they occur again. Our consulting team regularly publishes perspectives (shorter, independent articles) that touch on the trends currently affecting our profession and the strategic issues facing our clients. This is one of our most recent posts, but the full catalog of our perspectives – over 100 published since 2005 – can be accessed via our blog.